On the 24th May 1804 Lord Hobart wrote to Governor King of New South Wales instructing him to form a settlement at Port Dalrymple with Lt. Col. William Paterson in command. The colonization of Port Dalrymple was a strategic move to secure British interest in Bass Strait, as well as providing a further colony to accommodate settlers removed from Norfolk Island. 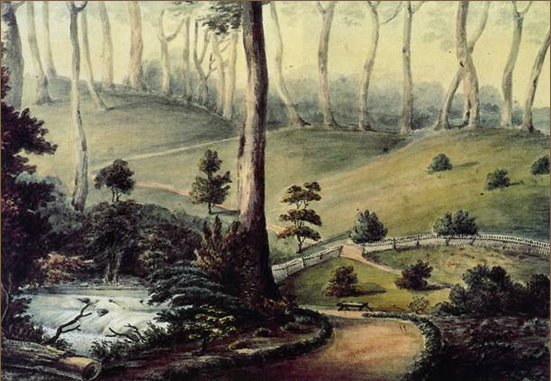 On the 8th of June 1804 Col. Paterson departed New South Wales only to turn back 11 days later due to the severity of winter gales. Mitchell Library, State Library of N.S.W. "You are hereby required and directed to proceed without loss of time with H.M. Buffalo to Port Dalrymple, on the south side of Bass’s Straits, with the armed tender Lady Nelson, the Francis and Integrity. You will receive on board Lieutenant Colonel William Paterson who has been directed to embark with the civil and military establishment. It may be necessary for the soldiers to assist in the duty of the ship, as well as guard the convicts, they will be victualled with full navy rations, the woman and children of such soldiers together with convicts, will be victualled at two- thirds allowance, without spirits". On the 15th of October Paterson sailed out of Sydney Harbour bound for Port Dalrymple. Heavy gales were encountered as they plied there way south. The ships became separated and it was the Buffalo that sailed into Port Dalrymple on the 4th of November followed by Integrity on the 5th and the Lady Nelson and the Francis on the 21st. A letter dated 26th of November from Lieutenant Governor Paterson to Governor King. Colonel Paterson writes of the camp at Outer Cove. He talks of the examination of the harbor as far as Swan Point. He states that he has lodged some stores under guard on Green Island and that dry stores are lodged in a well thatched hut near his own house until a better building can be erected. On the 11th His Majesty’s Colours were hoisted with the usual Ceremony under Royal Salute from the Buffalo. The next day they proceeded to clear ground for temporary buildings and cultivation. Paterson stated that he had made several short excursions in the vicinity of the Cove but had not yet discovered anything to recommend it as a permanent situation. However the area was convenient for the receiving of stores and if the run of water continued all year there may be 100 acres fit for cultivation and pasture for a few cattle. most eligible situation for the seat of government. On the 27th of December, in a letter to Governor King Paterson writes that on the 28th of November he embarked on board the Lady Nelson with Ensign Hugh Piper, Mr. Mountgarrett, a Corporal and five soldiers to proceed up the River for the purpose of exploration and evaluation. He would then report his findings to the Governor. Paterson found that the country in general exceeded his expectations in respect to fresh water and good soil. On the 15th of December Paterson revisited Western Arm wishing to be satisfied with respect to its situation. It was still his opinion that the head of Western Arm was the most eligible situation for a permanent residence. At this time he named the area Yorkton (York Town) and the hill to the right Mount Albany. The explorers then continued on to Lower Head. Paterson found a large Lagoon; this area was convenient for the landing of cattle and the pasture so excellent that it induced Paterson to continue Outer Cove as a Port. On the 17th of December Paterson marked out the ground at York Town for the erection of Quarters and had the Prisoners employed in the embarking of the two wooden houses and other stores on board the Lady Nelson and Francis. Part of the stores and working hands were then transported across from Outer Cove to York Town to enable buildings to be erected before the winter season began. In a letter from Governor King to Paterson dated 28th of January 1805 Governor King commented on the selection of the site for the new settlement. He concurred that Paterson would be the best judge of the most eligible place for the principle settlement and securing the best situation for Settlers. Governor King also writes of the advantages Paterson had stated respecting Western Arm, which pointed it out to be the most eligible place for the headquarters. In addition he approved of the name given to the intended town as well as the district. Paterson wrote to Governor King on the 8th of January informing him of his preparations for removal to York Town. He had employed three soldiers (carpenters) to assist in the building of temporary quarters before he moved the military from the Cove. 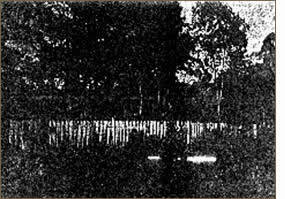 An area of better than forty acres had been cleared between the two runs at Western Arm, which would soon be burnt off to prevent any accidents by fire happening to the huts, as these were to be thatched for the present. As soon as this was achieved he intended to employ all hands to erect a strong log house for the stores. This done, he removed most of the detachment from Outer Cove to prevent any criminal activities taking place. In a letter to Governor King dated 21st February 1805 Paterson writes of a short excursion from the settlement at Western Arm on the 9th of February. He mentions finding blackwood and wattle the only wood as yet found useful for shingles. He also states that he has discovered sassafras growing in considerable quantities and fit for many purposes. The best being for house building and boats. Paterson also writes of problems he is having with a species of ant that has been eating the leaves off the plants of grains and oats in his garden at Outer Cove, but adds, that at Western Arm, he did not have any problems with insect pests eating the vegetables. He was however concerned about the abundance in number of small rat like quadrupeds between the two burns. These had been eating the potatoes, french beans and other large seeds. In the same letter Paterson discusses the store at Western Arm that he hopes to start building immediately. He proposes that it will be logged and shingled and of sufficient dimensions. He comments that Palmer's mill may be of great acquisition. In March 1805 William Paterson’s wife Eliza joined him. Both she and her servant Hannah (Ann Williams) sailed from Port Jackson on the Buffalo. On the 14th of November 1805 Paterson wrote to Earl Camden recalling the past twelve months He felt that the greatest part of the difficulties had been surmounted. The stores were well secured in substantial buildings, all of the officers had houses, the detachment was in good huts and the prisoners were comfortably sheltered. On the same date Paterson wrote to Governor King. In regards to public buildings he felt he had done as much as possible and intended to go on with brick making through the summer when he hoped to have a substantial jail built. At that time there was a small brick one well secured behind the Guard House paling. A public oven was also erected. Then Paterson faced major concerns although the settlers worked hard they were faced with many problems. When the cold of winter set in their cattle began to die in large numbers; crops failed and food supplies diminished; morale was low. Good grazing land fresh water and an excellent deep water port were some of the things which prompted Paterson to propose a removal of Headquarters to Riching’s Park (Launceston). On the 27th of September 1807 Governor Bligh wrote to Paterson concerned at the distribution of convicts - forty-two at York Town and fifty-four at Launceston. He was distressed at the lack of permanent Headquarters and Paterson’s inability to supervise the people under his control. 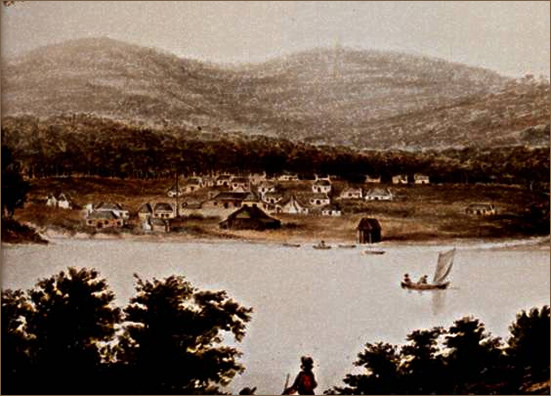 Although Launceston became the principle settlement in the north Paterson continued to live at York Town until 1808. York Town lays claim to being the first declared permanent settlement in the north of the state. In it’s heyday boasting many residences set in Botanical Gardens some of these included Lieutenant Governor Paterson’s house, Soldiers Barracks, Guard House, Store and many dwellings some built with bricks made on the site. The settlement had a substantial population set in an area of 40 acres. The Cemetery is no longer recognizable and like its inhabitants some of the town still remains buried underground but occasionally remnants make their way to the surface to remind us of a past that has been forgotten. York Town is without a doubt an important historical site of national importance.